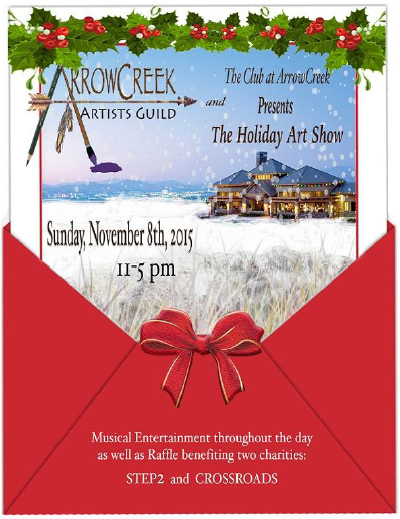 The ArrowCreek Art Guild Presents their “Holiday Art and Music Extravaganza” on Sunday November 8th, 11am to 5pm. The Club at ArrowCreek will stage the venue for the artists to exhibit their diverse artistic talents which include; painting, sculpture, glass, wood carving, jewelry, fabric arts, mosaics, ceramics and photography. The Clubhouse will be available for visitors to enjoy “Happy Hour” prices on select beverages and plates while being accompanied by local musicians through out the day. Raffle tickets will be available for purchase. The proceeds will be donated to Step 2, and organization that provides women struggling to overcome substance abuse, poverty and family violence to rebuild their lives. A raffle ticket will be given in exchange for bringing hotel size toiletries which will be donated to Cross Roads which is a housing program that assists local men and women in making the transition from substance abuse and homelessness to a productive and healthy lifestyle. This entry was posted in ArrowCreek, ArrowCreek Art Guild, ArrowCreek Artists Guild, ArrowCreek411, Art, Art Appreciation, Art Show, Holiday Art and Music Extravaganza, The Club at ArrowCreek, Things To Do In Reno and tagged ArrowCreek, ArrowCreek 411, ArrowCreek Art Guild, ArrowCreek Art Guild Art Show, ArrowCreek Art Show, ArrowCreek Artists Guild, ArrowCreek411, Art & Music, Art Show, Holiday Art and Music Extravaganza, The Club at ArrowCreek, Things to Do. Bookmark the permalink.